Hot Chili Peppers - Friend or Foe? Hot chili peppers.... Never has there been a food to inspire both wonder and wariness, love and hate. 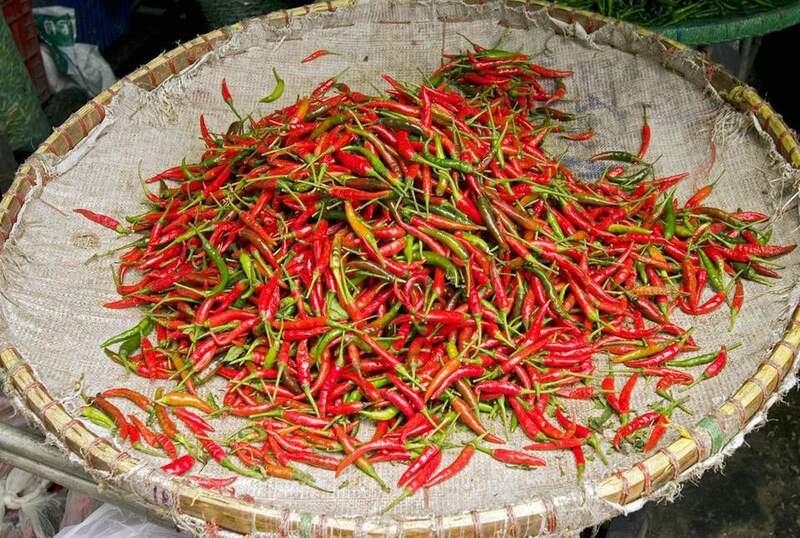 If just the sight of some hot chilies in your Thai dish makes your stomach spasm, your body is talking to you. After years of working as a Thai chef, I've learned a thing or two about chilies and their various health benefits as well as reasons you might not want to eat them - all of this depending on your current state of health. For more information, read on. Now, having touted the health benefits of hot chillies, I must also add a cautionary note. Six years ago, when I developed breast cancer, the treatments left my stomach raw and inflamed. Around that time I had also switched to an Asian diet which would help me heal from the cancer and prevent it from coming back (which it did). The only problem was that I continued to eat my chili sauces and fresh-cut chili peppers. My stomach couldn’t take it, and I was soon going back to the hospital for an inflamed stomach lining and possibly ulcers. I was told NOT to eat chilies—-that this was the main culprit. Actually, the culprit was chemotherapy, and the cure? Staying away from hot spices, including red chilies and even black pepper. Also coffee, vinegar, lime and lemon juice - anything that is naturally corrosive. I began seeking out fresh cayenne chilies for my Thai cooking. When I couldn’t find them, I bought the dry ground cayenne pepper in the spice aisle. I began using it to make Thai Nam Prik Pao Chili Sauce, and added it in all my recipes whenever I wanted some “heat”. I even began growing my own fresh cayenne peppers, which I still do to this day (pots of them can be found all over my deck and garden during the summer months!). Now I find I can eat any type of chili peppers, but only sparingly (a meal here and there at a Thai restaurant is fine). So, if you suffer from a sensitive stomach, ulcers, or heartburn, I highly recommend either staying away from all chili peppers or trying just a little cayenne pepper in your recipes. And when you're ready, try my own chili sauce recipe, which is quick to make and includes instructions for using cayenne pepper: Homemade Thai Chili Sauce Recipe (Nam Prik Pao). Your body will be able to fight inflammation, a leading cause of disease. Everyone these days seems to be talking about inflammation—not the type you get when you get a cut or a pimple, but inflammation inside our bodies and cells, the kind that can’t be seen, preventing diseases like arthritis and diabetes, and possibly cancer. In fact, studies have shown that those cultures whose diets includes plenty of hot chilies have lower rates of certain types of cancer, including colon and stomach cancer.